Summary: vWatson Wicks, also known as pumice wicks, are a very simple, inexpensive septic system alternative; shallow, subsurface bio swales designed to reuse the nutrients and water in blackwater for irrigating and feeding plants. Tom Watson —the guru. 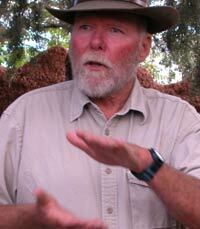 He's available for consulting at PO Box 8, Embudo, NM 87531 or (505) 579-4001. Forget everything you think you know about conventional wastewater system design. Crazed genius Tom Watson has come up with a design which breaks every rule in the book. You could call it a shallow cesspool which receives rainwater as well as sewage, and has an overflow to daylight (that sound you hear is the rules breaking). Or, you could call it a subsurface bioswale which provides all the advantages of a flush toilet, septic system, and composting toilet, with lush plants around it and few of the disadvantages. Tom has installed systems at 9000 feet in New Mexico. The oldest systems are pushing thirty. Some are working perfectly, some are not. Something highly significant is definitely going on here. If you ask Tom how they work, you'll get an answer that sounds like the the sound of one hand clapping. Tom really knows his stuff, but he thinks so far out of the box that it is hard to grok what he is saying sometimes. "People want answers, not questions, but every system is different..."
"With an understanding of first principles, you can derive the system design for any given context on your own...at least in theory. It is an art as much as a science." "Keep pulling yourself away from thinking of it as an object, think of it as a process." "Treat wastewater as landscape architecture opportunity." "Mainly people have to go out and do it themselves. Learn first principles, then go do it themselves..."
The rest of this is my notes on conversations with Tom, collated with my experiences building a few wicks myself, and a few of my thoughts in [brackets]. CAUTION: these are just unchecked notes which we may someday check, refine, expand, and turn into a book or a chapter in a book. If you want this to happen, vote for Watson Wicks on our Vote for new books & articles page. Also, while many of these are working flawlessly, a significant fraction have failed. Why are there no turds in the rainforest? Why aren't pine needles 50 feet deep? It's because the mulch reaches an equilibrium with what's eating it and stays there. In response to the action of roots and soil organisms, the soil around properly designed and and installed Watson Wick becomes more permeable, higher organic matter, and of better tilth as the system ages. This is in contrast to a conventional septic system, where the permeability and tilth of the soil declines. You are making a garden which uses the resource, not a disposal system. Wastewater returns to hydrologic cycle via the air (transpiration) rather than the groundwater. In the case of a structure with wastewater sources on all sides of the building, a Wick can be installed to serve each side. A toilet can also sit right on top of a Wick, for example in a greenhouse. So the Oasis of green it nourishes adds to the ambiance right around the home. Real monitors of system are plants and how they are doing. Paths for free air circulation are provided by pumice. The most common failures are from failure to provide for a drain to daylight, digging the system too deep, or using too fine of aggregate. A pumice filled trench which has at least fifteen feet of aggregate to "open water" inside an infiltrator is a crucial but often omitted feature. This drain should be from the level of the *bottom* of the infiltrator, not the top. Without this drain, a peak load can jump the system from an equilibrium with a 1/2"-1" deep anaerobic "bathtub" to a deepening bathtub death spiral. When the bathtub edges reach the top of the infiltrator, the system functions more like a septic tank and has much lower capacity. With pump out tank don't need trench to daylight. The system has to be in the top foot or two of soil, where plant roots and soil organisms are most active. 21" is the typical max excavation depth, with 1-6" of soil over the top of a 16" infiltrator. House drains often exit too deep for optimum Watson Wick depth. If it is necessary to place a system deeper, air can be introduced deep into the soil column by backfilling with coarse pumice, with only a thin layer of soil on top. Just be sure you have a drain to daylight as per above. Pumice fines, fine soil, or other fine aggregate can cause clogging at the infiltrator louvers. This kind of failure can be identified by a high water level visible inside the infiltrator inspection port and lower level or no water in on inspection of the surrounding pumice. This kind of failure can be avoided by using coarse aggregate; over 3/8" in diameter, over 1/2" preferred. Another option is to use more infiltrators, in which case the backfill can be native soil. Requires a much bigger system. The design must be considered in a whole systems context, or you'll have a higher probability of failure. Back up experiments with a redundant system; failure of the experiment can be relieved by switching to the backup (the system capacity recharges on giving the soil a rest). The backup could be an alternate infiltrator set, or another kind of toilet, or a toilet in an alternate location. Codes must ultimately adapt to solutions rather than visa versa. Be allies with the code people to help them adapt codes to solutions. 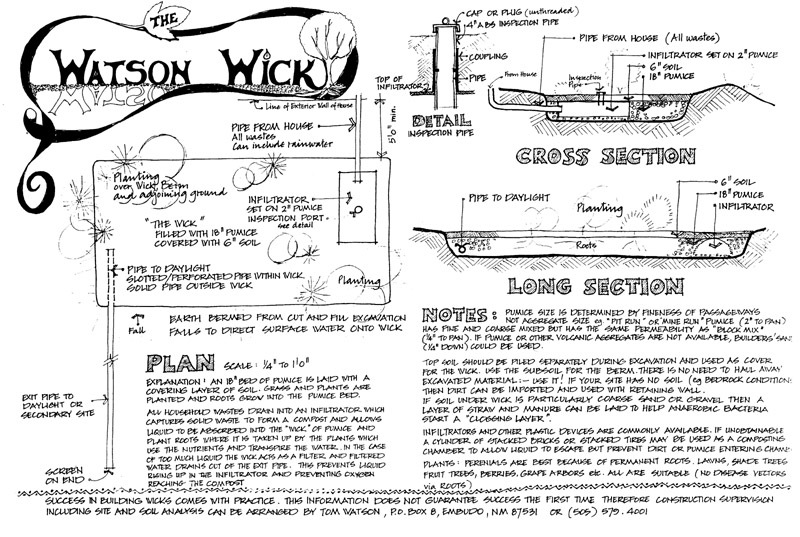 Some Watson Wicks have been code approved under experimental permits in New Mexico. Tom found little or no free water in the soil space 8-18" below the infiltrators in established Wicks in New Mexico, using ceramic probes which fill with water. It was frequently observed that there were more roots in the pumice than the soil, perhaps due to the presence of more air. The wastewater mix coming into infiltrators seeks a common level, even across a long distance. I asked what Tom expected the wastewater level difference to be across a thirty foot length of one foot wide infiltrators fed from one end and he felt there would be little or none. Always provide for a drain to daylight. A dead flat expanse of lawn with a raised berm and hardened overflow is the perfect receptacle for rain water to flush the system and keep plants growing well. Flat ground promotes rain infiltration, which is good for infiltrators in dry climates. Since the floors seal with a low-permeability anaerobic mat, you can make the most of each infiltrator by placing it flat, possibly stair-stepping down hills, with an overflow 1" from the bottom of the uphill infiltrator cascading overflow to the inlet of the next infiltrator in series, and so on. The Wick which I've monitored most closely is built on a steep slope (not advisable if you can help it) and it is loaded intermittently. I've never seen evidence of generalized anaerobic conditions or a mat inside. Part of the artistic camouflage to minimize the visible difference in turf growth from areas underlain with pumice, infiltrator, or native soil. Pumice over the top of an infiltrator, while it seems it would dry out the turf above, actually helps wet the overlying soil by allowing for vapor transport of moisture from below. As little as 1" of soil will filter out sewage odors. Salts don't disappear, get diluted and redistributed. A "bathtub" lined with an anaerobic bacterial mat of low permeability typically forms in the bottom of the infiltrators. The depth of this tub will rise and fall with the balance between the aerobic and anaerobic bacteria at the upper edge of the tub. More water will enable the anaerobes to build the wall up, which will contain still more water, and so on. Less water leaves the edge dry, so aerobic bacteria can eat it, dropping the water level further. Tom occasionally jump starts the anaerobic slime mat by smearing the bottom of the infiltrators with pig manure. Anaerobic mat depends on absence of oxygen, presence of creatures. Creatures are designed to get their mat more extensive; it reduces the permeability by about a factor of 100. This makes a feedback loop: water at 1", mat up to 1.25"...water level rises, etc. The system size, overflow height will determine the dynamic balance and water level in system. If the system isn't designed right, anaerobic mat will get ahead of aerobes and system failure will result. The inside of the chamber is so wet and warm that material will compost as if it were inside of a compost pile. Ability of system to absorb surges without going into destructive positive feedback loop depends on its size and the presence of a drain. No problem with intermittent loading. Drying out is perfect conditions for complete breakdown. Doesn't seem to be a problem in practice (see example at 9000' elevation, below) If frost line is four feet, two foot deep infiltrators don't seem to be a problem. A system at a bed and breakfast at 9000' in New Mexico. It performed perfectly for many years. At some point the inlet pipe separated from the infiltrator, and roots blocked the inlet, an easily-remedied problem. Never had to take gorp out. Don't have to dig to inspect. See enough through 4" inspection port that you won't need another. Put another big access at the other extreme end—pop off to see what's happening at end. Use periscope with light: Has LED light w/ mirrors. Don't usually have to move gorp. Toss in a handful of red wigglers each season for toilet paper. Check fauna inside. Easiest to pump out with wet/ dry vac. Do whatever is easy to build. If you're hand-digging, do it easy to hand dig. If back hoeing, do it easy to backhoe—but don't dig too deep. If slower than 60 min per inch. 3 infiltrators, 50 gal 1" deep, will soak in through mat. Just use more infiltrators if you don't want to surround infiltrators with aggregate. Rather than rise & clog, liquid will spread through aggregate on bottom of excavation. Do three infiltrators then add more if needed. Mature system would be equally wet throughout. When digging, when trench is done and appropriately sized, roughen walls, add hydrogen peroxide to walls to roughen, if smeared smooth by digging tools.. Adding compost on construction unnecessary. Inspection port/ overflow at inlet pipe, mid or end of infiltrator. Could you include a sketch or image of what this looks like?